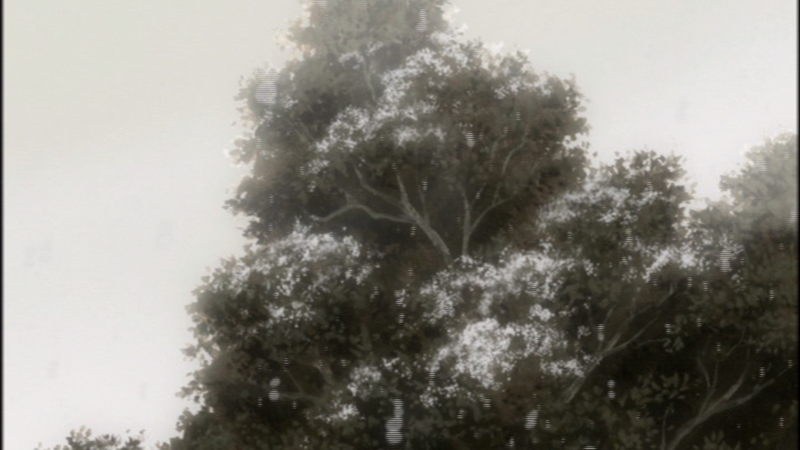 I'm rewatching Mushishi on DVD and blogging it. Previous post here. First post here. You can watch this episode and the rest of the series legally (and free) on Youtube. For those in need of a refresher, there's a list of brief episode descriptions here. Have you ever found yourself pretending you have something you don't? This happens often with a lot of things, especially those on the intangible side: bravery, intelligence, clout, happiness, and so on. Each of us, when this happens, live out our own little fantasy. Hardly a high crime. But it's important to remember that at the end of the day, it's still a lie. "Pretense of Spring" is, as can be inferred from the title, about falsehoods. But it's the nature of those falsehoods and the ways that we let ourselves be fooled by them that stand at the core of the episode; those are what I want to talk about here. For instance, I live of the lie of thinking that if I watched enough Bob Ross videos I, too, could apply Titanium White so artfully. As you might imagine, I've been quite excited about the third season of Working! !, and I've now had a chance to see the first episode in the series' latest offering. What follows is my meticulous, fully comprehensive review. In my previous post, I kind of glossed over my rationale for the artistry of games. It wasn't really the point of the post, or something I care to argue about - I was instead attempting to explore an example that confuses the interpretation of that artistry rather splendidly. After it came up in the comments section, however, I feel that omitting an explanation of my own was a mistake. This began as a reply, but got long enough that I opted to give it a post of its own rather than split it into several nested comments. Also, fair warning: wall of text ahead. Video games, if you weren't aware, get kind of a bad rap among the other art forms. In one of the more famous (infamous?) defamations in the last half decade, the late Roger Ebert railed on the medium as a whole, opening with the line, "Video Games Can Never be Art". This, and the many criticisms like it, led me to adopt an interesting defense; anytime someone questioned games' artistic potential, I'd replace "video game" with "book" and see if the logic behind the argument still held up (outside of Ebert's own piece, this rarely happened). That idea eventually matured into something I call "interaction literacy", the notion that most non-gamers don't know how to "read" games and hence don't understand them, just as a language illiterate person would be unable to fully comprehend books. This idea, as it turns out, is not one that only I hold. In an RPS interview with Charlie Brooker, he expressed the idea rather eloquently, so I'll just link it (note: strong language, most relevant part towards the bottom) rather than give you an arduous, long-winded explanation myself. (EDIT: I lied, I wrote one after all) The point is: a lot of people don't really "get" video games - as in, they don't actually have the necessary training and experience to understand them. All this to say, much of the populace find games weird, and this explanation helped me understand how. Video games are an interactive medium, and more importantly an interactive art - they only show you their best when you're in the actual act of interacting with them, of playing them. Without that understanding, they devolve into a mere curiosity, a banal mess of game mechanics and art assets and sounds and programming; some putrid undead creature, its form a pale reflection of the chunks of rotting flesh that compose it. Let me tell you: I get it. I totally get it, and it's all thanks to one game. One weird, weird, French, independent cyberpunk-dystopian-grimdark first-person-shooter-RPG-action game. Allow me to introduce you to the bizarre, eldritch existence that is E.Y.E: Divine Cybermancy. A lot of people see family as something to be endured. They're restrictive. They don't understand. They disagree on crucial aspects of society, culture, and life in general. Family is more hard than anything else. And that's. . .fair. I personally have kept on pretty good terms with my family and have the great fortune of them being, in my eyes, largely intelligent, compassionate human beings. And you know what? They still get on my nerves. I've never been so full of rage or frustration or sadness at anyone the way I have been at family members. I can't imagine what it's like when you have blood relatives as vile as some of the ones I've heard of from other people. That said, I've also never loved anyone so completely as my family. They are so, so precious to me, in a way I can't fully describe. You know how people bond over hardship? I guess it's kind of like that, only. . .more. Family doesn't have to be anything special, and for a lot of people it isn't. But it can be something amazing, something important, something precious. They're can be a lifeline, a safety net. They're like a big warm blanket that might also happen to be incredibly itchy and uncomfortable; you can despise it and adore it all at once, but however you feel about it, it might be the only thing keeping you from dying of exposure. That's what this episode is about; families, the things they take from you, and the things they give you. 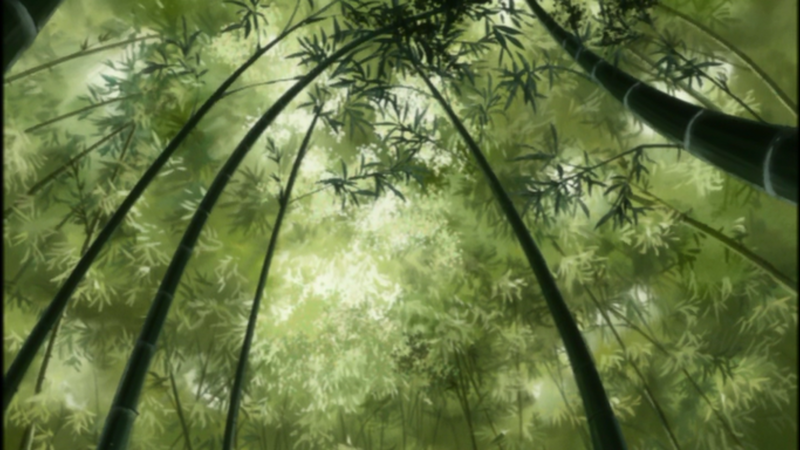 Well, families and my favorite thing about Mushishi: bamboo! I'm Sato, a student/tutor/software developer. I publish new posts on a semi-regular monthly basis, except when I don't. Need to get in touch? Send me an e-mail at: JohnCSato [at] Gmail [dot] com.